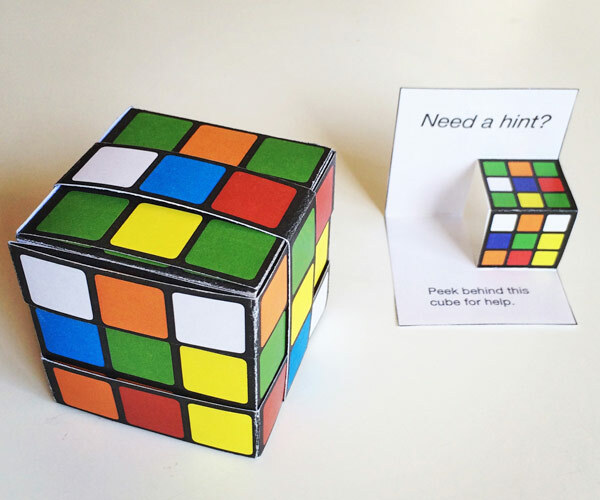 This printable paper Rubik’s cube looks exactly like the real thing, all scrambled up, but it is a box. It is also a puzzle, which you can solve just like the original Rubik’s cube — only it’s a whole lot easier. 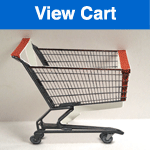 Use it to wrap a gift or to hold treats as a party give-away. 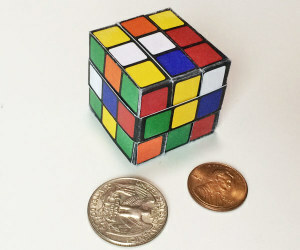 The download is formatted to be printed on 2 sheets of standard letter sized (or A4) paper, and your finished cube will be a regulation sized 5.7cm Rubik’s cube. It also includes a pop-up gift label, but instead of a tab to hold your box shut, you can cut out a sliding paper ring. The PDF download comes with written and illustrated instructions, or you can watch a video tutorial for the 2015 calendar, which has the same design as this box. 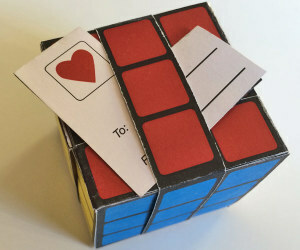 The Rubik’s cube is easy to make with a pair of scissors and a touch of glue. For best results, print on light card stock. 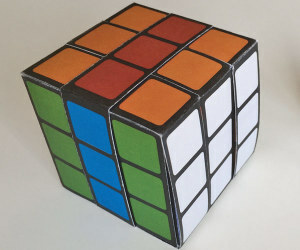 How does the Paper Rubik’s cube work? The puzzle box mechanism is simple to operate, but counterintuitive. Start by opening the box. Easy, right? All you need to do is rotate the two parts of the box on the hinge. But then KEEP ON ROTATING the parts in the same direction! The two parts rotate around each other without ever becoming detached. 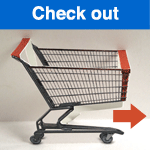 The hinge itself moves around the box edges, and finally ends up on the opposite rim. Meanwhile, the pattern on the box has been magically replaced by a completely different pattern. 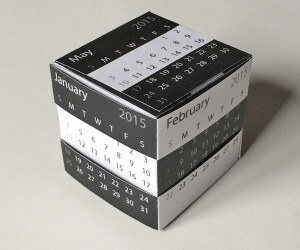 If you like the Rubik’s cube, you might also want to check out the 2017 desk calendar or the mini Rubik’s cube, cut in one piece from a sheet of letter sized paper.